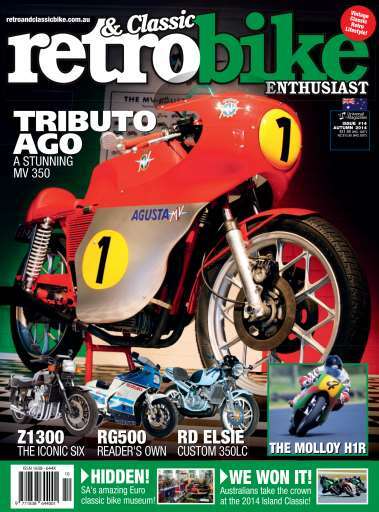 Download your copy now to read all about an amazing commemorative RD350R LC – one man’s method of celebrating 50 years of Yamaha GP racing and 30 years since the arrival of this iconic line of bikes, while we also feature an stunning big bore ‘Tributo Ago’ MV Agusta – the 1976 350 Ipotesi. In Vintage bikes Alan Cathcart also tests out a Kawasaki H1R at Phillip Island, and reminisces about the bike’s history and impact! Plus we also look at Kawasaki’s Z1300 six-cylinder, a Reader’s Resto Triumph T100R and owning the awesome Suzuki RG500! We've covered the Island Classic down at Phillip Island, explore the Peterborough Motorcycle Museum and take a glimpse into Rob Iannucci’s life, plus all the regulars including – I Remember, Poppa Shaw, Bailey, Walker, updates on Jeff’s GSX-R750F, Mick’s K2 Busa and Richard’s Lambretta and Ducati 900SS. We also look at servicing your own forks, plus buyer’s guides for the Yamaha RZV500 and Suzuki RG500. Plus lots more!